Reduce, reuse, recycle. It's a mantra used by people who want to spread the word of conservation efforts that people can do from their own home. And environmental issues have become a cornerstone of the print industry. One Australian university has taken the printing industry's connection to the environment to a new level by using a label printer to create solar panels. 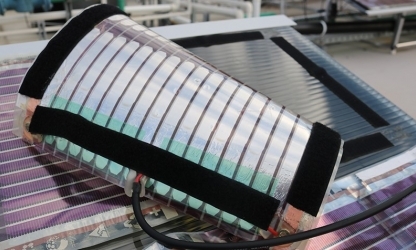 The University of Newcastle created the solar panels by printing electronic ink onto thin, clear laminated sheets using a regular printing press. Prof. Paul Dastoor, leader of the research team, pioneered the idea of electronic ink and its printing process. "On the back of five years of in-house development, all of the components of these advanced electronic inks are now synthesized at scale within our Center for Organic Electronics using non-toxic, carbon-based materials," he told Labels and Labeling. "These components are then used directly or further processed into water-based inks and paints." Dastoor said that the project is a demonstration of how the technology could grow into a commercial reality and be further utilized. What's interesting here is the process of printing electronic ink. This could be used as a development in athletic apparel that utilizes technology, like heart rate monitors. It's also a development in environmentally-conscious technology. "If you had just 10 of these printers operating around the clock, we could print enough material to deliver power to 1,000 homes a day," Prof. Dastoor said.